ADV-8716 - 16-Channel Receiver / IPTV Gateway | AdvancedDigital Inc. The ADV-8716 is a high-density Receiver / IPTV Gateway equipped with 16 independent RF tuners, these can either one of DVB-S/S2, DVB-C/T/T2, ISDB-T and ATSC. It is also equipped with 2 ASI input ports. 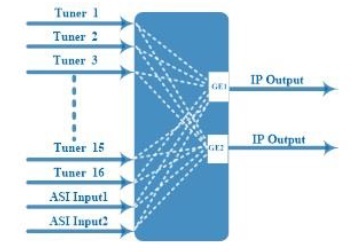 The device contains a built-in remultiplexer and can output up to 16 MPTS or up to 512 SPTS over UDP and RTP/RTSP protocols. The built-in web server allows for the configuration of the ADV-8716 with a standard web browser.